On this page I will be writing and posting things of interest to me and maybe to you and all things happening in the world of Laurie Jo. This weekend is Art in the Park in Boulder City, NV. 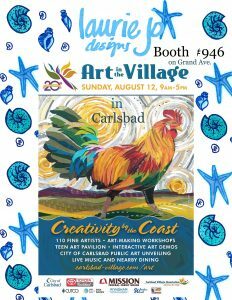 A fun festival filled with great art and food and entertainment. See you there. Hopefully, it will be cooler in Carlsbad tomorrow. See you in the Village.